Street Name Address Plaque 1 Line Traditional Oval - - simulated carved wood accents add sophisticated elegance to the decorative border. Personalized with the address number you supply. Made in USA. Wall mount or Lawn mount. Lawn sign includes one 18" lawn stake for convenient setup. Oval shape. 16" x 9.5". Traditional style. Includes one line of personalization. Line 1 holds up to five (5) 4" characters for the address number. AC antique copper (large image). Small images (from left to right):). BG black surface with gold characters; BS black surface with silver characters; BV bronze verde; OB oil rubbed bronze; OG bronze surface with gold characters; and PS pewter surface with silver characters. Dimensions: 16"W x 9.5"H x .375. 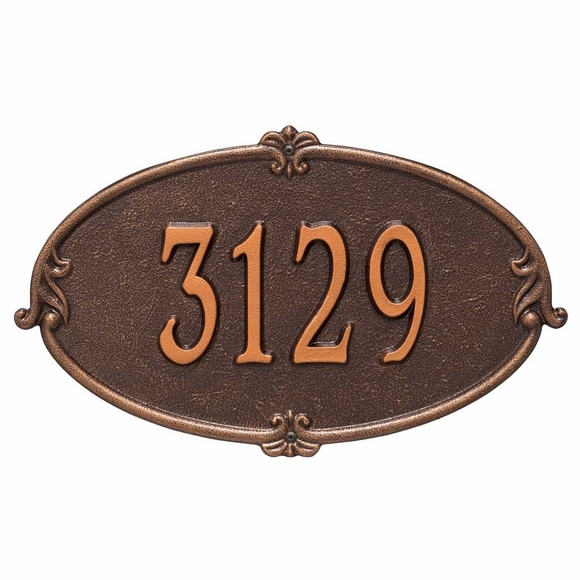 To purchase a two-line version of this sign that includes the house number and street name, click the top link in Related Products.